MacPilot is a software utility that helps you to easily enable and disable (aka hack) hidden or customize features in Mac OS X without having to use the terminal or remember cumbersome commands. 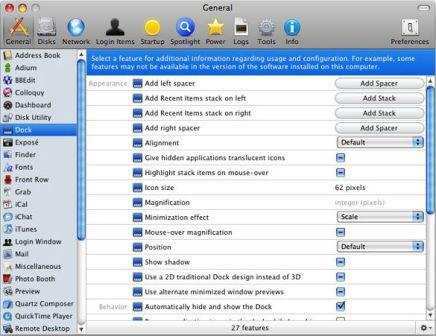 With MacPilot, users can also optimize and repair the Mac system, and perform numerous routine maintenance operations with the click of a button. Pro user or not, you can now increase computer performance with only a few clicks of the mouse. Optimize your network for broadband connectivity, completely customize Apple File Sharing, perform essential maintenance without having to remember mind boggling acronyms, and much more. However, those are just a few of the many reasons why MacPilot is your choice over Cocktail, TinkerTool and Onyx! Disable the translucent menubar in Leopard, disable menu items for security, disable icon caches, set history limits, erase recently used files, prevent your dock from being modified, turn off all system animations, increase the speed at which windows resize, change which format screenshots are taken in, set a default name and location for screenshots, disable a secondary processor, disable the startup chime, and even change the login window picture! People who wants to try out MacPilot can download mac_pilot.dmg to install MacPilot as 15-day trial version. And if you like it, now, thanks to the Mac Pilot developer, Koingo Software (koingosw.com), there is 25 licenses (5 reserved for active forum contributors) to giveaway to My Digital Life readers, which costs $19.95 each. However, no purchase necessary to receive a free copy of MacPilot license. Not lucky draw either. Instead, just post comments or ping back from your blog will do. To get a free licensed copy of MacPilot for Mac OS X platform, simply be the LAST 5 comment posters or pingbacks (for blog owners) on any of the following 4 contest periods. Winner: Randall, Laure, ravi chauhan, Rajesh (3 hours passed without next comment), Thomas. Winner: Doug, Rob (misidentify) Mik (3 hours passed without next comment), Kilian, Ni, NISHANT. Note: We’re giving away all leftover licenses from the forum. Additional Winner: mark m, Alex, Jonathan, Eric. So almost everybody who posted comment get a license. Thanks for participation, and do look over for more freebie giveaway. Note that the server time is based on GMT+8, so the posters of last 5 comments with closest date and time to the contest period cutoff time based on UTC+8 (as highlight in bold) will be the winners. The comments must be posted BEFORE the cutoff time, meaning if the end time is on 15:00 pm, only those posted before 15:00 pm (e.g. 14:59 pm) will be considered, and the comments that appear with 15:00 pm as its posting time will participate in next giveaway period, or in the case of 4th giveaway period, fails to win the free license for MacPilot. Each contest period has 5 licenses of MacPilot to win for unlimited usage of MacPilot. Winners of previous round should not participate in the giveaway again. The wild card in the giveaway is that if your comment lasts for 3 hours without any new comment been made, you win a free copy of MacPilot automatically, and the number of available free license will be deduct by one for the rest of contest period. The contest period will close immediately when all 5 licenses is gave away via wild card method. IMPORTANT: A valid email address must be entered in the “Mail” field, else you will be disqualified even if you’re last 5 posters. It’s not necessary and not recommended to put your email address in the comment. In the case of blog pingback, we’ll contact the winner by using Whois information or contact form on the blog. You’re welcome to post as many comments or pingbacks as you want, but spam will be disqualified. My Digital Life reserves the final rights and says on everything regarding the giveaway. Your privacy will be respected. The email entered will be only used for the purpose for the giveaway only, i.e. will be passed to Koingo Software, as all winners will receive the free license directly from developer. Emails will not be sold or shared, but it will be retained by cookie to simply the auto complete the comment form on this blog. Start commenting and happy winning.